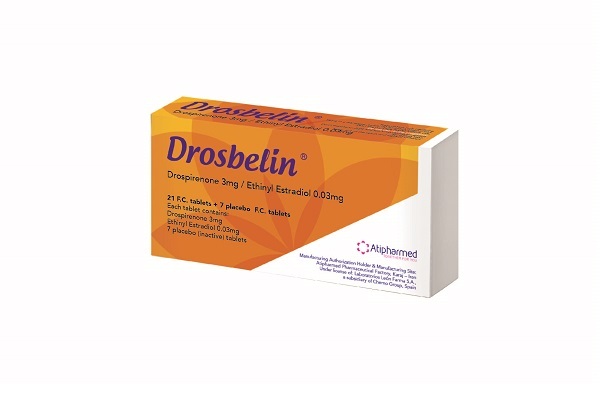 Drosbelin is a combined oral contraceptive which its progesteronic component called drospirenone and estrogenic component called ethinylestradiol. Drosbelin is a fourth-generation contraceptive pill. Drosbelin is being produced for the first time under the license of CHEMO Company in the Atipharmed International Pharmacy Company of Iran. By transferring the technology of making this drug to the country, the appropriate pharmacy industry will be provided. Reduce LDL and increase HDL (in Long-term). Each blister contains 21 pink tablets (containing hormone) and 7 white tablets of placebo (without hormone) arranged in sequence. Drosbelin is given daily one tablet at a given time (every 24 hours) with or without food. After taking the fourth white tablet, the next dose of the tablet will begin, whether the bleeding has been discontinued or not. If used in the manner described by Drosbelin, even when taking 7 white pills without hormone, protection against pregnancy will be achieved, but it is necessary to use another contraceptive method in the first 7 days of the first course of drug use.